Sunday's launch came 14 months after an attempt to put satellites in orbit ended in a deadly explosion. That rocket blew up before take-off from the Alcantara launch site in northern Brazil, killing 21 people, including key technicians. At the time of last year's explosion, some predicted it would take years for the programme to recover. Now there is likely to be jubilation that a VSV-30, or Brazilian Exploration Vehicle, has been successfully launched, also from Alcantara. Sunday's project was a less ambitious one, designed to carry out experiments just outside the Earth's atmosphere at a maximum height of 250km. 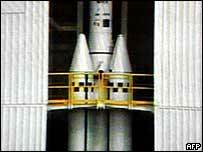 Brazil is hoping the launch will boost its space programme. The Alcantara Base should give Brazil a strong advantage over competitors. Only 2.3 degrees from the Equator, the base is considered the perfect launch site. This is where the earth moves at its fastest, giving the rockets an initial boost so they need less fuel and can carry heavier payloads.